Oh yes man, that's so good. 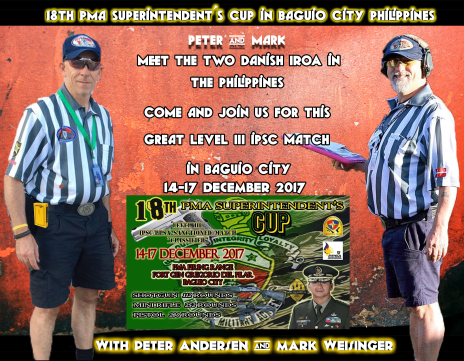 Then it's time for another level III IPSC / PPSA match, this time in Baguio. I had applied to work as RO in this match but here is also on the waiting list as Level III in Batangas, and I do not understand I'm usually get the job, something is wrong, but I decided to bring my uniform if someone not turn up. My friend from Denmark Mark Weisinger had to work on this match as Area CRO and I decided that if I cannot work the match, I would shoot the match and stay up there and enjoy. Mark and I took the bus from Pasay in Manila at 11:45 pm and about 41/2 hours later we were in Baguio at 4:30 am. So we should just find a hotel were we could sleep and after about 30 minutes we found one that we had for 2 days, a nice hotel with ok food in the restaurant. We found Range Master Gil P Quejada, which I have known for some years, incredibly handsome man. First I was told that there was enough RO for the match, so I had to find another place to stay, as Mark who works on the match gets free accommodation, and as a shooter you have to pay. But the incredibly nice MD Mr. Allan Margarata offered me that we could get a room together in the PMA area and at the same place where all the RO was going to stay. But after the first night where we were freezing and there was no hot water, we chose to find a hotel where we could stay and again an incredibly good and friendly RO Mr. Edgar Martinez offered us a room at the same hotel where he stay ( So Mark and I would like to say thanks for the incredible gesture you did for us Edgar, not only with the hotel, Edgar also driven to and from the range every day, we also drove with him and also back to Manila after the match so we did not have to take the bus. THANK YOU SO MUCH EDGAR ) It turned out that this was not a bad idea at all, as in the same parking lot at the hotel there was a restaurant that had the best mushroom soup that I have tasted for a long time and we got that soup every day. After a few phone calls on some misunderstandings, I was told that I could work on the match. So after working 2 days at the pre-match on stage 2 ( up and down stages with 10 minitaget, I shot the match on Friday as I had to borrow the gun of my team mate and he came Friday. Some difficult challenge stages with far target, 1/2 targets, mini target etc but real good stages. Thanks to my squad with my team mate Guyena, my good friend Major Jun Lorenzo, Bryan Icaro, Edwin T. Guzman and our best of the best homeboy Daniel Mendoza Cabarles, who is always with us.